Dennis Kucinich, Jonathan Tasini, and... Edolphus Towns. Deborah Glick, Liz Krueger, and... Martin Malave Dilan. The first two names in each trio are noted progressives, while those coming third are undistinguished products of the Brooklyn machine (who also support Atlantic Yards). Towns and Dilan have drawn criticism from progressives for their votes, respectively, for the Central American Free Trade Agreement (CAFTA) and to require inadequate protections against lead-paint hazards. But all have received campaign contributions from Michael Ratner (right), the eminent human rights lawyer. While Ratner's not talking, his Brooklyn political contributions seem guided not by ideology but by the interests of Forest City Ratner (FCR), the development company run by his brother Bruce. Michael Ratner and his wife, Karen Ranucci, both Greenwich Village residents, have recently made campaign contributions using Forest City Ratner's Brooklyn building as a return address. Ranucci has matched many of her husband's contributions. And Bruce Ratner's girlfriend, Pamela Lipkin, as well as other Ratner family members, have made contributions engineered by an FCR lobbying firm. Even though Bruce Ratner no longer contributes to political races himself, his inner circle seems willing to help out. Indeed, Michael Ratner/Ranucci contributions to Yvette Clarke suggest that the developer supports--or at least supported--the pro-AY City Councilwoman in her bid to win the tight four-person race for the open 11th Congressional District seat. Here's an example of how the fundraising works. City Council candidate Letitia James late in her 2003 campaign called Bruce Bender, Forest City Ratner's executive vice president for government and public affairs. Her campaign needed some money. When I pointed out the identities of the donors, James told me that she knew that FCR had contributed to her campaign, but hadn't known the names. And yes, she realizes that the developer probably feels betrayed that, after her election, she emerged as a staunch opponent of Atlantic Yards, which was officially announced on 12/10/03. Among the Ratner family members, Michael Ratner has the highest individual profile; as president of the Center for Constitutional Rights (CCR), he's led the fight to provide legal representation and fair procedures for Guantanamo detainees. Harper's publisher John D. MacArthur called him "America's most important civil libertarian." His wife Ranucci is (updated 2/17/08) development director of the progressive radio show Democracy Now. Is there a larger agenda to Michael Ratner's contributions? Two candidates receiving recent contributions, Dilan and Silver, are running unopposed in the Democratic primary, which is tantamount to election. Moreover, three contributions each from Michael Ratner and Ranucci appear in the state campaign finance database as being sent not from Manhattan, but from 1 Metro Tech Center North, the same building where Forest City Ratner has its headquarters. I tried to query Ratner via CCR's press counsel, Riptide Communications. "Michael doesn't speak about his political contributions," spokeswoman Mahdis Keshavarz told me. Though [Bruce] Ratner’s company still spends significant funds to lobby City Hall, Ratner a few years ago sharply cut back on donating funds to political campaigns - an unusual move for a real estate developer. “He decided this was getting him into trouble, because every time he won a project, people would say it was because he gave money,” said former city Parks Commissioner Henry Stern, who has known Ratner for 34 years. Dilan won his 2004 race by a more than 8 to 1 margin and faces the same Republican today, with no Democratic primary. He doesn't need the money. 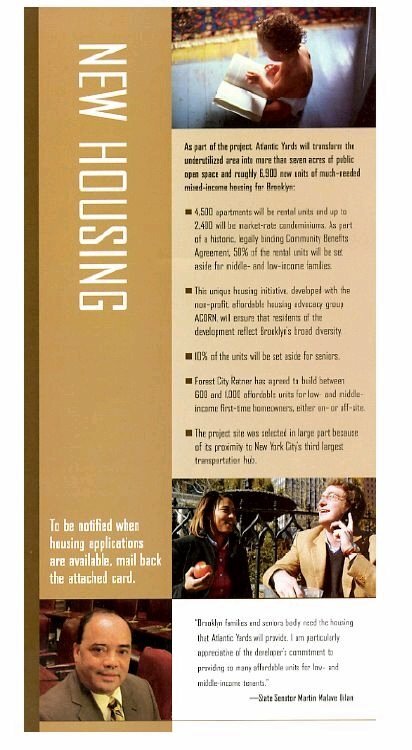 Were the contributions to ensure his appearance in a Forest City Ratner mailer (right) sent in May? Michael Ratner and Ranucci each sent $3000 contributions to Assembly Speaker Silver on 6/8/06 via the MetroTech address. Silver is untouchable as a candidate, but he wields the key vote on the three-person Public Authorities Control Board, which must vote to approve the Atlantic Yards project after the Empire State Development Corporation signs off. It's not a formality; Silver stopped the West Side Stadium. The state campaign finance database suggests two patterns regarding Michael Ratner's giving. He has supported Manhattan progressives like Assemblymember Glick and State Senator Krueger, likely out of ideological conviction. On the other hand, Michael Ratner and Ranucci have made regular contributions to Brooklyn clubhouse candidates. They each made $2000 contributions on 1/6/04 to State Senator Carl Kruger [corrected 2/08: I originally had Carl Andrews], $2500 contributions on 9/4/02 to Assemblyman Roger Green, now a leading supporter of the Atlantic Yards plan, and $3100 contributions on 8/2/2000 to Assemblyman and then county Democratic leader Clarence Norman, who early this year received a two- to six-year prison sentence for campaign violations. Michael Ratner and Ranucci on 10/20/05 each gave $2000 to Clarke, one of the four candidates for the open 11th Congressional District seat. Clarke was considered a leading candidate due to her history in the district and her gender, but has faltered recently after acknowledging she didn't actually graduate from college. Michael Ratner and Ranucci on 11/7/05 each gave $2000 to incumbent Towns, who represents the 10th Congressional District. Towns is being challenged by Assemblyman Green, a fellow Atlantic Yards supporter, but his more serious rival is City Councilman Charles Barron, a project opponent. The contribution from the Manhattan progressives to Towns came just a few months after he provoked the ire of labor and Democratic activists for his CAFTA vote. In 2001, Michele de Milly, whose firm has long done p.r. for FCR, organized five contributions of $4500--for a total of $22,500--to William Thompson's campaign for city comptroller. The donors were Michael Ratner, Ranucci, Lipkin, Bruce Ratner's daughter Rebecca Ratner, and Ellen Ratner of Washington, another family member. Thompson is now a supporter of the Atlantic Yards project, even though it raises similar issues--questionable financing and the absence of a transparent public process--that he cited when criticizing Mayor Mike Bloomberg's Hudson Yards plan in October 2004. Lipkin has made fewer contributions, though she did give $4950 last year to the campaign of Public Advocate Betsy Gotbaum. Gotbaum was criticized severely for supporting the Atlantic Yards project while claiming to be opposed to the use of eminent domain. Forest City Ratner has three Bronx projects, but they've been up and running for a while, so it's not easy to discern a connection between FCR interests and Michael Ratner's $6000 contribution to the Bronx Democratic Trustees Committee on 12/5/05. Ratner and Ranucci each gave $2000 on 11/30/05 to the campaign of Bronx Assemblyman Jose Rivera, the county Democratic Party chair, who is running unopposed. Rivera is a development enthusiast. According to Gotham Gazette, at an April City Council meeting on the new Yankee Stadium plan, Bronx Democratic boss Jose Rivera led a group of construction workers in a cheer of "Build It Now!" Another curious pair of Michael Ratner/Ranucci contributions came just last week, on 8/31/06, when each gave $5400--from the MetroTech address--to the reelection campaign of State Senator Marc Coppola, who's in a tight primary race upstate. It's unclear what interest two Greenwich Village residents have in a campaign to represent Buffalo and Niagara Falls. Nearly all of Coppola's donors are local. Still he has played a key role in discussion of a proposed Buffalo casino, which is highly controversial. Forest City Ratner was lobbying New York City regarding casino gambling way back in 1999. And Forest City Ratner's parent company, Forest City Enterprises, has tried to get into the casino business in Pittsburgh. A check of the campaign database this morning showed additional $5400 contributions from both Michael Ratner and Ranucci to State Senator John Sabini of Queens, who's in a hard-fought primary battle against City Councilman Hiram Monserrate. Both contributions were sent from the MetroTech address. More contributions may surface as candidates belatedly file their disclosure forms. Perhaps the topic that best highlighted the differing political styles of Monserrate and Sabini was issue of eminent domain at Willets Point. The pair both agreed that any use of eminent domain, generally speaking, should be held to the highest scrutiny, but Monserrate has been an outspoken critic of using eminent domain at Willets Point at all, whereas Sabini has largely played a behind-the-scenes role, or no role in Monserrate's opinion. And Forest City Ratner is a finalist for the redevelopment plan at Willets Point. All of these contributions are NOT about supporting one person or another but rather supporting party machines. Ratner knows little or nothing about do nothing polls like Dylan and Sabini. He does know that by supporting these people the County organization will not get behind any efforts to get Silver to take a hard look at these projects and he might keep Silver from using his vote on this projecct as part of this own patronage/extortion game around large scale projects. These contributions are so much cheeper than having to hire Silver's former Chief of Staff and Bruno's son. Pretty disappointing to find this out about Michael Ratner. I listen to his radio program on WBAI and support his work with the Center for Constitutional Rights. It's funny that he would not be able to see that dislocating poor people from their housing is just as much a violation of human rights as locking people up at GITMO, especially when real estate in NY is so expensive.